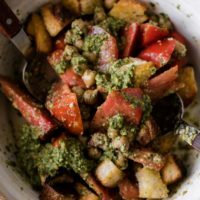 Chickpea Tomato Bread Salad with Arugula Pesto | Naturally. Greens: Swap the arugula for spinach or kale. You could also add greens to the salad and turn it into a more traditional salad. Lettuce would work great as a base for a salad like this. Beans: Swap the chickpeas for white beans or possibly even black or French lentils. Grains: If bread isn’t your jam, swap it out for cooked grains. Heartier grains like farro, sorghum, or barley would work well. Every time I end up at the market this time of year, I’m always drawn to all the varieties of tomatoes. It’s peak time to snag fresh tomatoes and eat them for every meal. 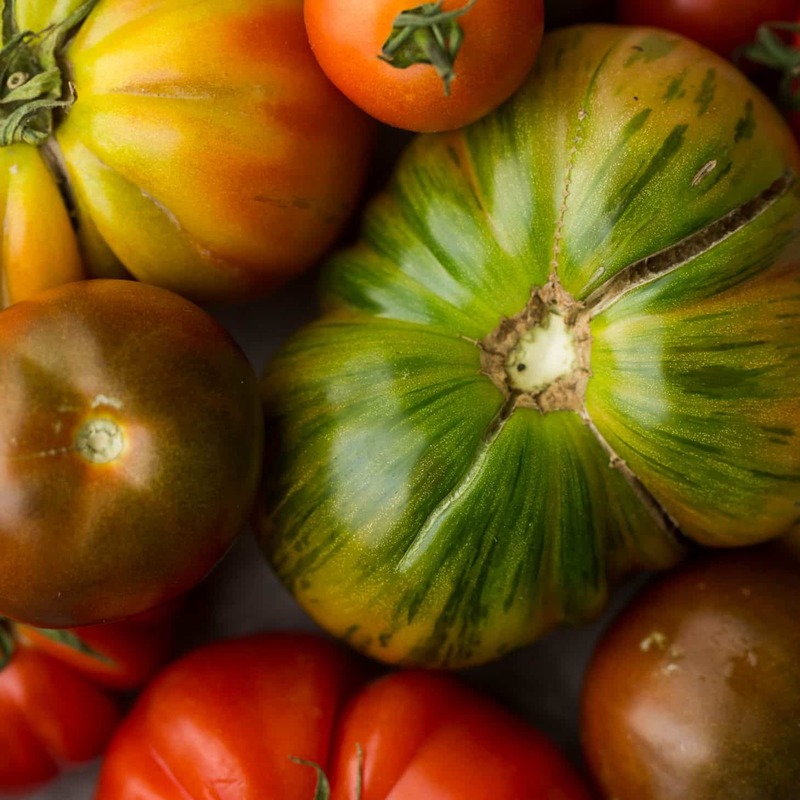 I always gravitate to the smaller tomatoes for use on salads but a big heirloom tomato makes a great addition to sandwiches. Heat an oven to 400˚F. Place the torn or cut bread on a sheet tray and pop in the oven. Cook until the bread is crisp throughout and golden; 15 minutes or so. Core the tomatoes and cut into 1” or so pieces. Place in a bowl and set aside. In a food processor or blender, combine the ingredients for the pesto. Pulse/blend until combined; adding more olive oil or a splash of water as needed to thin well enough to blend. Measure out about ⅓ cup of the pesto and save the rest to use in another meal. Heat a skillet over medium heat. Add the olive oil, chickpeas, and garlic. Cook until the garlic is fragrant and the chickpeas are hot; 3 to 4 minutes. 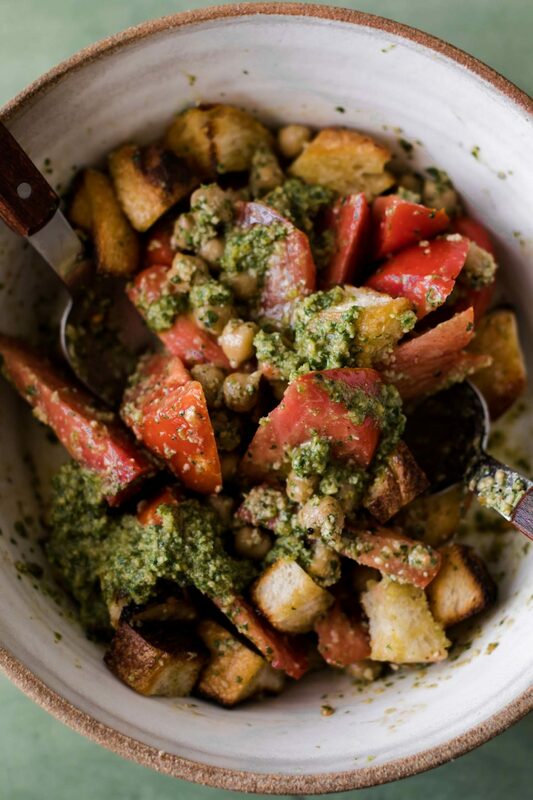 Combine the croutons with the tomatoes, pesto, and garlicky chickpeas. Toss until well combined. Taste and add more salt if desired. Tips + Tricks: the arugula pesto is great on pasta, pizza, and on grilled cheese sandwiches. You can even freeze it if needed. OH, yeah — We are going to enjoy this meal ! When you mention bread in the ingredients, is that 1 1/2 Cups of pieces or 1 1/2 slices of bread (pieces) or is that all the same? Thank you for you and your food inspirations, Heidi and happy tomato season to all. Hello! I used about 1 1/2 cups (I just updated to add ‘cups’). Can I use broken up pieces of dried crispbread? Sure- the texture might not be the same but I think it would work. I just made this recipe tonight. Delicious! The texture was amazing. I subbed spinach for arugula and almonds for walnuts. I skipped cooking the chickpeas (just used rinsed canned) and it was still great! I will definitely make again.